February may still feel grey and wintery, but venture into the garden and you'll see new growth and shoots appearing, as well as early year stalwarts like snowdrops and hellebores. This month is the time to take stock of what you've got - tidying up herbaceous borders and pruning - and planting new plants as the soil warms. Act now to reap the rewards of a beautiful garden all year long. Here's some inspiration for gardening jobs to do this month. Don't take this as gospel - it will depend on localised frost, rainfall and cold - but it's good to bear these gardening tasks in mind. Start dahlia tubers into growth in the greenhouse. Prune late summer flowering shrubs, such as buddleias. Do the final pruning of wisteria, cutting back laterals and side shoots to within two or three buds of the main stem. 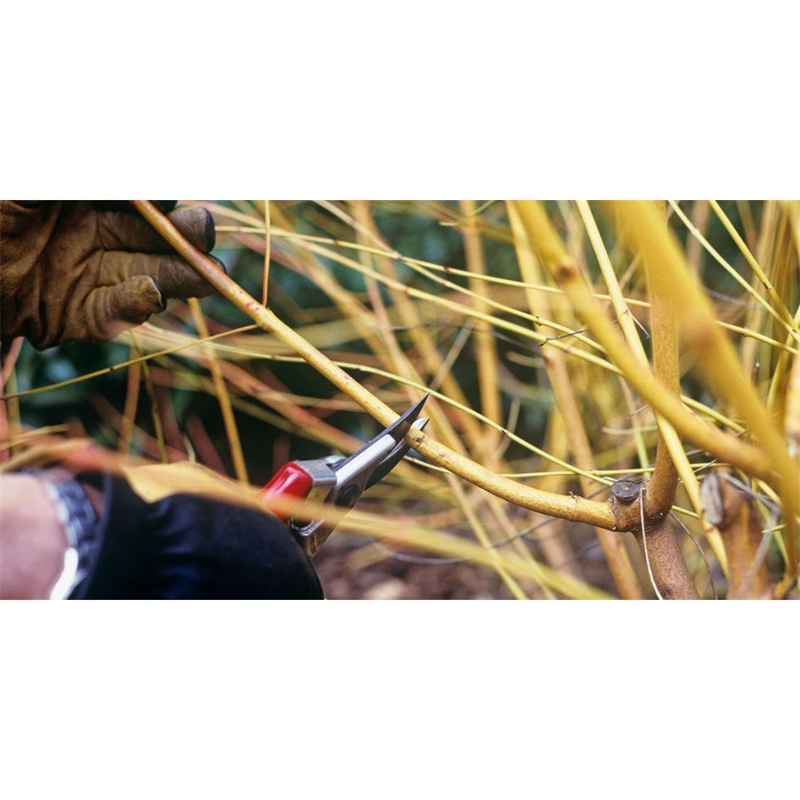 The brightly coloured stems of salix and cornus should be cut back to between 5-15cm from the ground to ensure more colourful stems next year. Plant hardy climbers 50cm away from the wall, if soil is not waterlogged. In dry weather, plant lily bulbs in well-drained soil enriched with rotted organic matter, in a sunny spot ideally shaded by plants such as rosemary or lavender. If lily beetle is a problem in your area, plant bulbs in pots and keep them undercover. Take root cuttings of eryngiums, oriental poppies, phlox, Japanese anemones and acanthus. Take cuttings from young, thick roots, trim into 5-10cm lengths, pot up with lower end facing down. The first February after planting, all types of clematis should be pruned back to the lowest one or two buds on each stem. This will encourage the young plant to produce plenty of bushy growth. Cut back ivy on walls before birds start nesting. Be ruthless - it will look better for a hard pruning with new shiny green leaves appearing. Direct sow peas and broad beans under fleece towards the end of the month. Prune branches of fruit trees showing signs of disease, die back or those that are crossing. Give them a good mulch with a general fertiliser. Sprout potato tubers by setting them out in egg boxes in a cool but frost-free position in good light. Plant out at Easter. Put cloches over strawberries to encourage early fruiting. Ventilate on warm, sunny days to allow insects to pollinate the flowers. Cut autumn-fruiting raspberries back to ground level. Tuck straw around rhubarb crowns and cover with a forcing jar for early stems. In fine weather continue to dig over the vegetable garden, adding compost or manure where required. Sow cauliflower and summer cabbage seeds. Pruning of apples, pears, currants and gooseberries should be completed by the end of February. Cut away and burn all dead, damaged and diseased wood. Sow parsley in mild weather in a herb bed near your back door. Ornamental grasses are probably looking a bit untidy. Trim spent flower stems back to the foliage, leaving a hard prune until spring. Take your mower to be serviced. Cut back large leaves on hellebores to reveal any shyly nodding flowers hidden beneath. Cut back deciduous hedges before birds have a chance to nest in them. Lift and divide congested clumps of snowdrops and winter aconites that have finished flowering. Trim winter-flowering heathers once their flowering stage has finished.